Visitors are welcome throughout the weekend, with most activities and stands open from 10am to 4pm. Naturally Deepdale Café will be open from 7.30am for breakfast and the shops of Dalegate Market will be open as they are throughout the year. 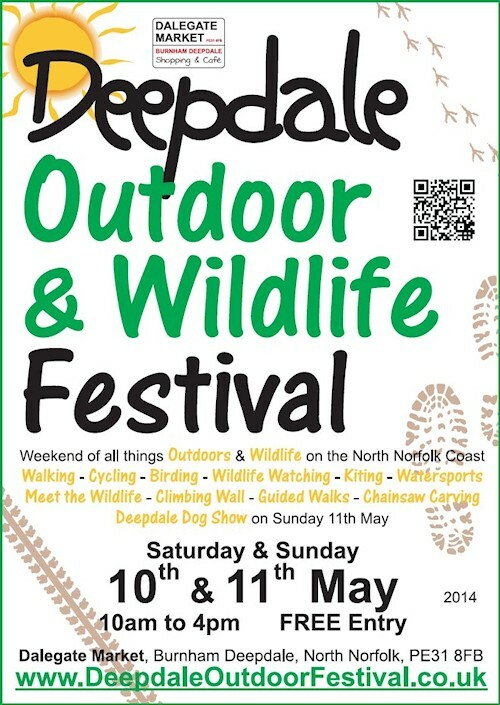 If you need further reasons for visiting the Deepdale Outdoor & Wildlife Festival, then please have a look around our website at www.deepdaleoutdoorfestival.co.uk to see great photos of last years festival and more information about all the activities, entertainment and stands. Can we sneak in an 11th or 21st reason (Who’s counting? ), which is the Brancaster Staithe Sailing Club Open Day – Push the Boat Out which takes place on Saturday 10th May. See you on Saturday 10th & Sunday 11th May at Dalegate Market in Burnham Deepdale on the beautiful North Norfolk Coast.